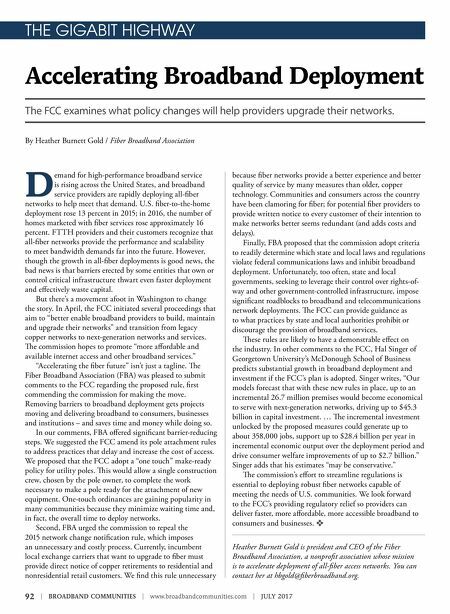 92 | BROADBAND COMMUNITIES | www.broadbandcommunities.com | JULY 2017 THE GIGABIT HIGHWAY Accelerating Broadband Deployment The FCC examines what policy changes will help providers upgrade their networks. By Heather Burnett Gold / Fiber Broadband Association D emand for high-performance broadband service is rising across the United States, and broadband service providers are rapidly deploying all-fiber networks to help meet that demand. U.S. fiber-to-the-home deployment rose 13 percent in 2015; in 2016, the number of homes marketed with fiber services rose approximately 16 percent. FTTH providers and their customers recognize that all-fiber networks provide the performance and scalability to meet bandwidth demands far into the future. However, though the growth in all-fiber deployments is good news, the bad news is that barriers erected by some entities that own or control critical infrastructure thwart even faster deployment and effectively waste capital. But there's a movement afoot in Washington to change the story. In April, the FCC initiated several proceedings that aim to "better enable broadband providers to build, maintain and upgrade their networks" and transition from legacy copper networks to next-generation networks and services. e commission hopes to promote "more affordable and available internet access and other broadband services." "Accelerating the fiber future" isn't just a tagline. e Fiber Broadband Association (FBA) was pleased to submit comments to the FCC regarding the proposed rule, first commending the commission for making the move. Removing barriers to broadband deployment gets projects moving and delivering broadband to consumers, businesses and institutions – and saves time and money while doing so. In our comments, FBA offered significant barrier-reducing steps. We suggested the FCC amend its pole attachment rules to address practices that delay and increase the cost of access. We proposed that the FCC adopt a "one touch" make-ready policy for utility poles. is would allow a single construction crew, chosen by the pole owner, to complete the work necessary to make a pole ready for the attachment of new equipment. One-touch ordinances are gaining popularity in many communities because they minimize waiting time and, in fact, the overall time to deploy networks. Second, FBA urged the commission to repeal the 2015 network change notification rule, which imposes an unnecessary and costly process. Currently, incumbent local exchange carriers that want to upgrade to fiber must provide direct notice of copper retirements to residential and nonresidential retail customers. We find this rule unnecessary because fiber networks provide a better experience and better quality of service by many measures than older, copper technology. Communities and consumers across the country have been clamoring for fiber; for potential fiber providers to provide written notice to every customer of their intention to make networks better seems redundant (and adds costs and delays). Finally, FBA proposed that the commission adopt criteria to readily determine which state and local laws and regulations violate federal communications laws and inhibit broadband deployment. Unfortunately, too often, state and local governments, seeking to leverage their control over rights-of- way and other government-controlled infrastructure, impose significant roadblocks to broadband and telecommunications network deployments. e FCC can provide guidance as to what practices by state and local authorities prohibit or discourage the provision of broadband services. ese rules are likely to have a demonstrable effect on the industry. In other comments to the FCC, Hal Singer of Georgetown University's McDonough School of Business predicts substantial growth in broadband deployment and investment if the FCC's plan is adopted. 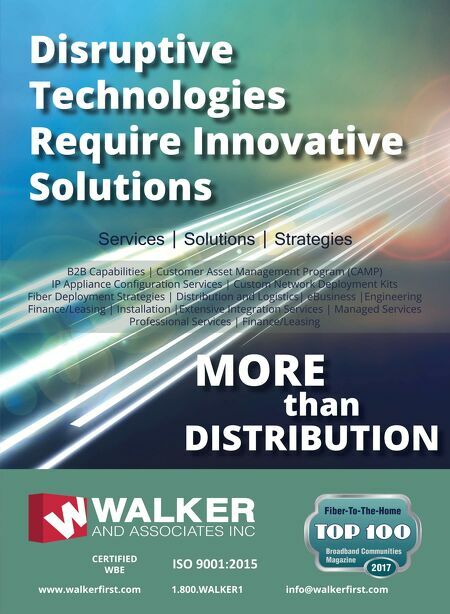 Singer writes, "Our models forecast that with these new rules in place, up to an incremental 26.7 million premises would become economical to serve with next-generation networks, driving up to $45.3 billion in capital investment. … e incremental investment unlocked by the proposed measures could generate up to about 358,000 jobs, support up to $28.4 billion per year in incremental economic output over the deployment period and drive consumer welfare improvements of up to $2.7 billion." Singer adds that his estimates "may be conservative." e commission's effort to streamline regulations is essential to deploying robust fiber networks capable of meeting the needs of U.S. communities. We look forward to the FCC's providing regulatory relief so providers can deliver faster, more affordable, more accessible broadband to consumers and businesses. v Heather Burnett Gold is president and CEO of the Fiber Broadband Association, a nonprofit association whose mission is to accelerate deployment of all-fiber access networks. You can contact her at hbgold@fiberbroadband.org.